Dunn's Rock Lodge, though not officially chartered until 1867, had its beginning several years earlier in the fraternity of men who became Masons on the battlefields of the Civil war. 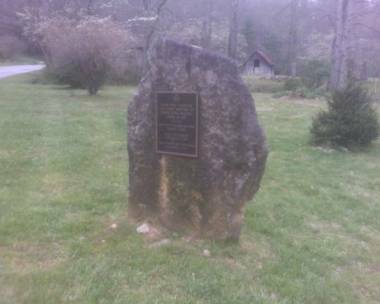 Passed down through the membership, this bit of lodge prehistory says that the idea of the lodge originated when Transylvania volunteers in the Confederate armies became Masons in military lodges of the North Carolina regiments, and began envisioning the local lodge they would found after the war. Following Appomattox, these Masons of the armies of Lee and Johnson, returned home in the dark days of the Reconstruction and immediately began laying their plans. They met in the open under the protecting ledge of Dunn's Rock, a huge rock outcrop overlooking the French Broad River valley. 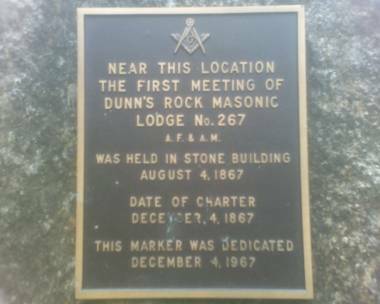 Because this was their first meeting place, and because Dunn's Rock was a historical landmark even then, it was chosen as the name of their lodge. There were, no doubt, many discussions around battlefield campfires, but serious talk of the local lodge can be dated from, mid-1865 with the first returning home of these soldier Masons, and the meetings below the rock. These were not lodge meetings; they were simply meetings of Masons. But the outgrowth was the lodge that was officially charted two years later and ever since has been Dunn's Rock Lodge No. 267, A.F. 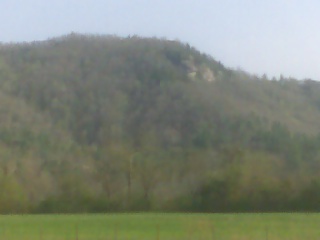 & A.M., Brevard. Dunn's Rock Lodge first met as a lodge is 1866, operating under dispensation. Its charter was granted several months later on December 4,1867. At this time, Brevard was only a crossroads settlement in the rugged mountain back county of western North Carolina. It consisted of a few rude buildings on a heavily wooded promontory crossed roughly north-south by the Asheville-Cherryfield Turnpike and a road leading southeast to Jones Gap and South Carolina. Even the county of Transylvania was new. It had been founded from parts of Henderson and Jackson Counties in 1861. Founding of Brevard, the county seat, had been delayed by the Civil War and it was not incorporated until 1868. Thus the lodge is one year older than Brevard and only six years younger than Transylvania County. The first lodge building was under Dunn's Rock near the site now marked by a historical marker, erected by local Masons, in the southwest corner of the intersection of Island Ford Road and U.S. Highway 276, about two miles south of Brevard. An interesting sidelight of the early lodge meetings held there after the charter was granted, is that these gatherings were often family socials as well as lodge meetings. According to handed down memories of early lodge officers and members, the wives and children accompanied the men and met below the rock. While the men sat in the lodge, they talked and played and fished in the French Broad River. Then, after the lodge meeting there were picnics where, no doubt, fresh fish and cornbread were prominent on the menu. This is, possibly, the origin of the traditional, public fish suppers that are still a major fund raising activity of the Brevard Lodge. The first Worshipful Master of Dunn's Rock was S.V. Pickens, an attorney of Hendersonville. A member of Mount Hermon Lodge, No.118, Asheville, Mr. Pickens had been asked to help organize the Brevard Lodge. He not only assisted prominently in the organization, but also demitted from Mount Hermon and moved his membership to Brevard, where he served two terms as Worshipful Master. Thomas L. Gash was the first Senior Warden and second W.M. It is from his recollections, years later, that many historical sidelights of the early days have been preserved. Many other men whose names are prominent in the history of Brevard and Transylvania County were early members and officers of the lodge, but their inclusion must wait the publication of a more comprehensive lodge history. During the years that followed the founding of Dunn's Rock Lodge, Brevard grew rapidly from the original few stores and houses into a thriving agricultural town. The lodge grew also, and meetings were moved from the cramped space in the old building under the rock to a hall in town. Then the railroad came to Brevard, with the first train arriving in 1894, and a mild building boom following in 1899. In 1903 the railroad was extended through Rosman to Lake Toxaway where developers had built the Lake Toxaway Hotel on a newly made lake in the area that was soon to become nationally famous as a recreation area for the very rich and famous. Joseph S. Silversteen, a brother Mason and later a member of Dunn's Rock lodge, brought forestry products industry to Rosman, nine miles west of Brevard, and Transylvania County began the combination of residential recreational attractions and industry for which it is still widely known. The first rental quarters in Brevard proved inadequate and the lodge moved, as it was to do several times in the fifty years that followed. Meeting where space could be found, the Masons saw the town and county continue to grow and the nation become a world power, weather World War I, and move into the 1920's. But toward the end of this period, with the membership grown from a handful to 152, the necessity became evident and a strong desire began to be expressed for a permanent home for the lodge. In 1926, with the lodge 59 years old, a start toward a permanent home was made. 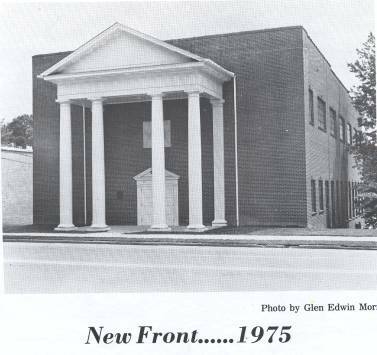 At that time, the lodge was meeting in the space above what was Gaither's Restaurant on North Broad Street (which is now Bracken Mountain Bakery). Meeting there, the members made plans to launch a subscription drive "to build a temple or try to find a more suitable meeting space. Dr. U. Summey, then Worshipful Master, appointed a building committee of which were himself, Dr. S.F. Zachary and E,W. Stanbery. Progress was slow. Nevertheless, the next several months were spent in searching for a suitable property on which to build; and, at a meeting it 1927, the membership voted to acquire a lot on Jordan Street, The purchase price was $15OO.OO. While money was being raised for building, the lodge had a committee looking for a better meeting place to be occupied as temporary quarters. The search extended through the beginning and early part of the Great Depression of the 1930's and ended in 1933 when space in the Erwin and Ramseur building was leased. 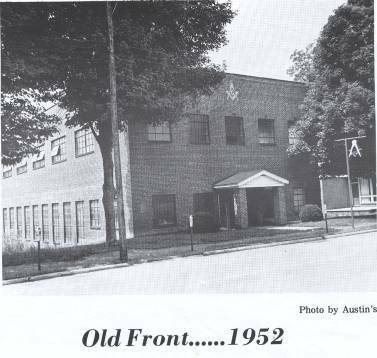 The lodge moved there and the first meeting has held July 14, 1933. Few people could spare money in the hard times of the depression, so the plan for building had to be put off. But in 1938, with times beginning to improve, another effort was begun. The lodge membership, fired by the enthusiasm of a Brother A.H. Harris. a former Mayor of Brevard, approved and the, then, Worshipful Master Leon English, Jr. appointed a Ways and Means Committee strictly charged with the task of finding ways and means of financing and building a Masonic Temple. At the time, the lodge was considering a building that could he built for $6000.00. the present site on East Main Street. The first lot was sold. World War II ended and fund raising continued. 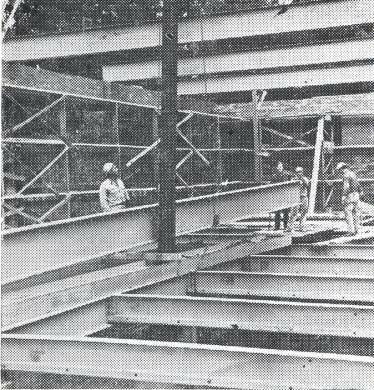 And finally, in early 1950, the treasurer was able to report a sound enough financial position to began construction. Ground was broken in April and the first payroll check, lodge records show, was issued on May 5, 1950. The first meeting, in the still far from finished temple, was held on June 26,1951. The cost of building up to that time, was in excess of $40,000.00. The next ninety years were spent in a continued effort to complete the temple while in use. Several fund raising drives were carried out with the last, before dedication, under the direction of the Transylvania Shrine Club, called the "Temple Completion Project. With funds raised through this and other drives, the dining room was finished and the heating system installed. The temple was dedicated on August12, 1960. The lodge was then 93 years old and the temple was the crowning achievement of 34 years of dedicated effort. Now Dunn's Rock Lodge is at home in one of the finest and most comfortable temples in the country. It is estimated that the building. if built today would cost $750,000.00. With a membership of 208 members, the lodge can be proud of over a century of growth in both Masonry and its position in a progressive community , growth that began 108 years ago with a few soldier Masons meeting under Dunn's Rock.